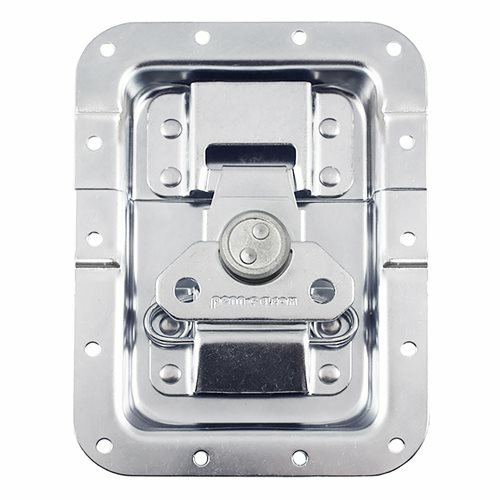 Large MOL® Recessed Butterfly Latch in Deep 27mm / 1 1/16 Offset Dish. 19mm / 3/4 From Split to Hole Centre. Securely close your case with a Penn Elcom MOL® automatic positioning latch mounted in a large recessed dish. For use on large-sized cases. The PennBrite zinc plating offers an excellent protection against corrosion with a distinctive bright Penn Elcom finish. The fixing holes are 19mm / 3/4 away from the central split of the dish making it perfect for tongue and groove edge extrusions. A 27mm / 1 1/16 offset on each half of the dish accommodates the corresponding edge extrusions and provides a flush and clean looking installation. Around the globe, the MOL® name is synonymous with high quality and dependability. Invented in 1995, the MOL® range of flight case latches revolutionised the industry and redefined standards in flight case locking. With its patented leaf-spring automatic opening system and its latch retainer that keeps the latch below the level of the dish while in the opened position, the MOL® range has yet to be surpassed in terms of advancement, durability, or prominence.